The Relentless Reader: Readathon Mini Reviews! Nope. Turns out I had accidentally requested a serialized children's version from my local library. I read nearly 50 pages before I realized my mistake. Whoops! I want to read the real thing, and soon. Those Morlocks freak me out and I wanna know more. Why did I make it to the age of...old before I got around to reading this? What can I say about it that you don't already know? It's biting satire of the finest sort. If you haven't read it yet that should be the first thing you do. Today. Now. What are you waiting for? This might be the perfect short story. It's short, bright, powerful, sharp, and HELLO IT'S SALINGER. There's something about McCuller's writing that makes one feel lonely and somber. You may have noticed that I actually like those sort of stories. Reading The Member of the Wedding was like listening to sad songs when your heart is broken. Necessary. Go into this one without reading the flap if you can. The story would have hit me a bit harder had I gone in totally blind. It was good, if not my exact cup of tea. It's twisty, dark, and a bit philosophical. Oh my word. What an eerie and first-rate book. It was my first Jackson and I can promise you that it won't be my last. How did she write like that? Do you ever wonder if some authors sell their souls to gain their skills? Damn. Not classics, (yet!) but they helped me cleanse my readerly palate in between the heavier reads above. They are bite-sized (ZOMBIE PUN!) guilty pleasure reads and I don't regret a minute of it. These comics are making my Goodreads stats look all wonky but I'll figure it out at the end of the year. Are you reading each TWD comic separately, or are you reading them in collected volumes? I was worried about my GR stats, too, but I've been reading them as collected volumes so I'm still adding whole books to GR instead of each separate issue. I'm reading them separately which is making my numbers bonkers. I'm a billion books ahead for my goal. Maybe I should delete them all and add them as a collected volume instead? I think you have a case of "I wish I'd written that" with Shirley Jackson. I need to read her. Ha! I love your comment about Jackson selling her soul! I have always wanted to read The Time Machine.... but I already saw the movie and it is one of my favorites. I want to read it too...the real one, lol. One of these days I'll get to it! I am so, so desperate to grab a copy of We Have Always Lived in the Castle. I KNOW I will love it. It's one of those books I search for whenever I walk into a used book store or library sale, even though I know I could go grab a new copy now. I just want to find it. You chose some GREAT stuff! Some I've read already, and some of them are sitting around here calling to me from the shelves. Of the lot, We Have Always Lived in the Castle is my super-fave. I adore Jackson so much! Thanks :D I had a really great day and I read some amazing books! I'm so glad I read that Jackson, wowza! I kind of loved my nostalgia read-a-thon. In the early morning when I hadn't even planned on being awake anymore, I think classic BSC was about the only thing my brain could have handled. What I found so interesting about my BSC and Nancy Drew reads was that a lot of scenes came back to me word-for-word. I knew exactly how a character was going to respond, or a certain bit of description, just before I actually read it. Apparently I re-read these a ton as a kid. It was the same kind of feeling as hearing a song you haven't heard since high school and realizing you still know all the words. Wow, you rocked it! I managed two books only, but I'm pleased with that. So glad you liked We Have Always Lived in the Castle -- it is so deliciously messed up! I haven't read Animal Farm, which oddly enough my wife just mentioned the other night randomly, so perhaps I will this summer! Thanks :D I read some super books. I hope you get to Animal Farm, it's quite the book! Nice work! I mean, you already do a phenomenal job raising the average number of books read per person, singlehandedly. But this is impressive for one long stretch. Lol, thanks! It turned out to be a very productive day. I think it really does matter how old we are when we read a certain book. For example, I'm convinced that I love The Catcher in the Rye because I read it when I was younger, etc. That's a perfect idea for a readathon! I might have to try that once. 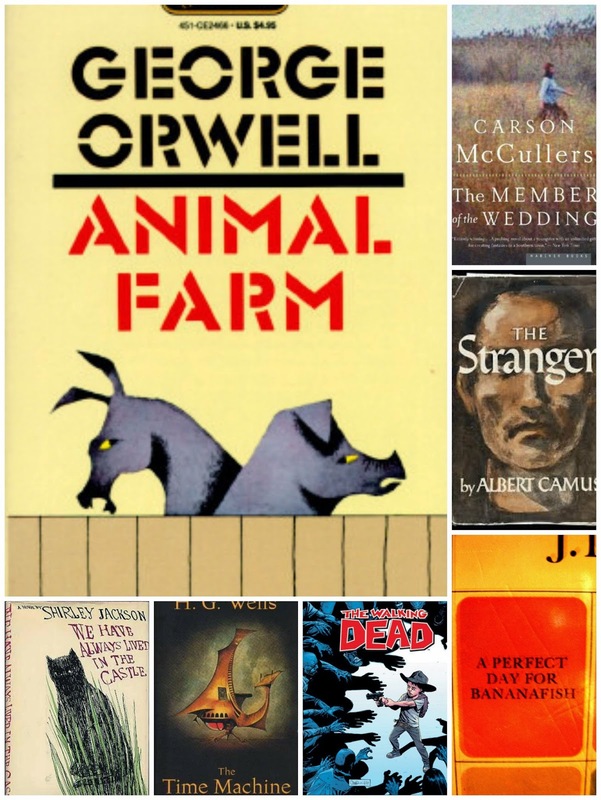 Animal Farm and The Stranger are two of my favorite classics. Glad you read them! What a great readathon idea, love the nostalgia idea, too! :) Way to go!!! Good times were had! I'm already looking forward to the next one, lol. Well, except for the hungover feeling I had the next day, ha! OOooh you made it through a great pile-o little books! I have read none of these and now want to read, oh all of them. If you only put one of these on your list let it be the Jackson. Oooh, it's good! I also read a couple of classics and was great! I have to read Animal farm! I'm glad, Isi! Yes, you really should read Animal Farm, it's something else! Doesn't that sound wonderful?? I think you've got an idea for your next readathon ;) I'm so glad you were able to play along this time. It's such a great event! I also really liked Jackson's The Haunting of Hill House. I want to read that one. I think I'll make it my spooky October read this year. Awesome, well done! I suppose if nothing else the children's version of The Time Machine gave you an idea of what the whole is like. I like the specific-ness of this. Short reads and classics. LOL, yes I think it did. I do want to read the real thing! Thanks :D It really worked for me! You read a lot for readathon. Congrats on your progress! Well, crap re: Time Machine! Oh well! Good job with the other bookies! I think I mentioned it on Goodreads, but I LOVE Carson McCullers. The Member of the Wedding is my favorite. If I ever have a daughter, I will seriously consider naming her Frances/Frankie. That would be an awesome name! I really like her too...such good stuff! Ahh, The Stranger. I read that for the first time this year (I think? Or was it last year...) and enjoyed it. Wish I had read it in school, I would've liked discussing it in a group. Also, this: "They are bite-sized (ZOMBIE PUN!)" just made my day.